Delano City Council members, left to right: Council Member Grace Vallejo, Council Member Joe Alindajao, Mayor Joe E. Aguirre, Mayor Pro Tem Liz Morris and Council Member Bryan Osorio. In this 2007 file photo, Bakersfield City Councilwoman Jacquie Sullivan holds up a framed poster that former trustee Chad Vegas wanted to place in every classroom in the Kern High School District. Vivas said he has been researching over the past year how cities in other areas of the country have implemented such decals and thought it would be an appropriate fit for Delano and Kern County. Osorio said that while he respects the motto, he believes there needs to be a healthy separation between church and state. While Vivas understands the motto has religious connotations, he said it’s more about expressing patriotism. Vivas said he believes the decals could help provide a more positive image for the police department. Bakersfield City Councilwoman Jacquie Sullivan said she is very excited about the development, having been part of a movement to have the motto placed in City Council chambers. The council approved displaying the motto in 2002, with the county Board of Supervisors following suit. Sullivan said to her knowledge the City Council has not considered adding the national motto to police cars, but said it’s something she wants to bring to the council’s attention in the near future in light of the Delano City Council’s historic vote. Vivas said in talking with the Delano Police Department, the plan is currently to place the decals on the back bumpers of the 50 or so patrol cars. The design of the decals is in the process of being completed. This is all starting to look like part of a ploy to "put in check" a young progressive city council man who is a threat to the rest of the much "older, politically conniving" Delano city council. The "Delano Swamp" is threatened because he got the most votes, for his individual office, than any of these other of these other "Swamp Creatuures" had received in years! This won't be the last time that an attempt will be made to weaken Bryan Osorio politically by making him appear anti-Christian and anti-American. The "Delano Swamp" needs to keep voter turnout low for each election cycle to insure re-election by just mobilizing their "minions" to vote and this is all taking place in District 4 which was created via a Federal lawsuit because historically these communities were victims of voter suppression due to a history of gerrymandering. Bryan Osorio is a "game changer" and the "Delano Swamp" doesn't like it when they don't have the upper hand with their local politics. The First Amendment and FaceBook are not at issue here--obviously redundant cites. Also, In the 1770s, symbols of unity were common on the money --See emblems on Continental Currency that inspired and reflected E pluribus unum (which reflected ONLY upon THE SEAL). Perhaps the reference to "GOD" also shows a need for a reflection on 'MORALITY' as at the beginnings of this country . . . and on our streets. Get your State sponsorship of a religion off of the tax-funded public service vehicles!! Your city will be sued and you will lose the case and money - The People's money - and AFTER you have been fairly warned of the consequences!!! Does this mean we should NOT be trusting in a democratic system of government for our justice? Do the police get to decide who is "God" and what God would do? Why didn't this story talk about how this is a national campaign promoted by local religion pusher? The Pledge of Allegiance to the Flag—"I pledge allegiance to the Flag of the United States of America, and to the Republic for which it stands, one Nation under God, indivisible, with liberty and justice for all. "—should be rendered by standing at attention facing the flag with the right hand over the heart. And for all the other Anti-Constitutionalists here . . . know this . . . LEST WE FORGET . . . how it all began . . .
"NATURE'S GOD . . . CREATOR . . .THE SUPREME JUDGE OF THE WORLD . . . "
"And . . . . with a firm reliance on the protection of DIVINE PROVIDENCE . . . "
( . . . .for and upon those others we ask and hope to traverse our highways and byways . . . to keep us SAFE . . . We also FIRMLY STATE and PLACE our "TRUST IN GOD" ). REMUDA, you DO understand that they decided to NOT have a government with a religion affiliated with it like England had, right? Out of 13 colonies, only VA had no official religion and that is the model they all decided to use for the new nation and when they wrote the constitution they eliminated any reference to Jesus, Christianity, the Bible, and only used the euphemism "creator" because many were Deist who did not believe any god played a role in daily life. It is a secular document, even tho' there was plenty of pressure to include religion. "In God we trust-all others please pay cash"
Instead of publicly endorse your version of Christianity, how about you shut your mouths and open your Bibles to Matthew 6:6. People who make a show of their religion are not favored by any God. Neither are obvious haters. Maybe you should shut your mouth and try actually reading (and comprehending) the Bible, particularly the many parts dealing with LOVE AND HATE, instead of cherry-picking scriptures which seemingly fit your hate-filled rhetoric. You obviously don't even understand the scripture you posted. 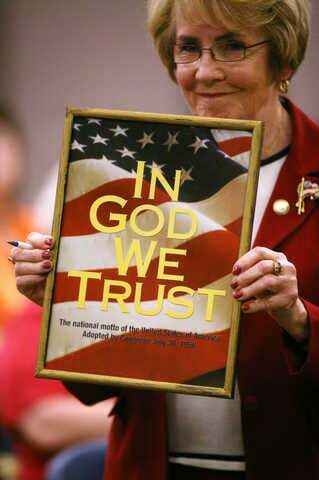 "In God We Trust" is a slogan, NOT a mandate. If you don't trust in God, (or religion, or whatever) then ignore the words and move on! No one is forcing you to take those words to heart. Although, in your case, I wouldn't want to be standing near you at Judgement Day. You might also want to see a surgeon about removing that plank from your eye. This is why I HATE Christians. You hypocrites would sh-t bricks if Muslims wanted to put a verse from the Koran on a cop car. What do you people not understand about the First Amendmnet and the separation of church and state? This is why I HATE Christians. You hypocrites would sh-t bricks if Muslims wanted to put a verse from the Koran on a cop car. What do you people NOT UNDERSTAND ABOUT THE FIRST AMENDMENT AND THE SEPARATION OF CHURCH AND STATE? You do know that the first amendment doesn't specifically state there is a separation of church and state, right? Thomas Jefferson is actually credited with coining that term, but he meant the government should not have any influence over the religious opinions of man; basically, so even you can understand, the government is forbidden from establishing a national religion or prohibiting freedom of individual religious opinion. irlopez only knows hate, so he probably shouldn't be quoting ANY scripture, but should be immersing himself in a contextual and comprehensive study of the Bible instead. I thought the us Constitution stipulates that religion and state should be kept separate. It is wrong for police cars to display that decal as it discriminates against those who believe otherwise or simply do not want a biased police department but one that is kept neutral.